Our birding in Northumbria began with a Great Black-backed Gull. An unremarkable find, you might think, but this one had caught a large flatfish on the estuary of the River Coquet and had bitten off more than it could chew. It highlighted how relatively ill-equipped gulls are to dealing with uncooperative prey. Having neither a tearing bill nor ripping talons, it was reduced to flailing and bashing, which obviously did for the fish but didn’t render it any smaller to swallow. After half an hour of determined assault and battery the fish finally went down, swelling the bird’s neck alarmingly as it slid through. A passing Eider dived down and dealt far more efficiently with a small crab as we left the Black-backed, rooted to the muddy bank, having consumed probably a third of its body weight. We were having a few days in Northumberland towards the end of September, staying at the Lindisfarne Inn, which is handily placed just next to the A1 at the top of the road leading to Holy Island. 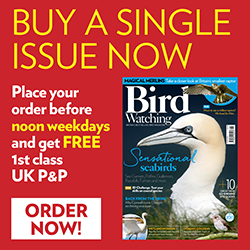 Our guide, Martin Kitching, runs Northern Wildlife Experience which specialises in bird tours around the Northumbrian coast and at inland sites such as Keilder Forest. He had suggested that we aim for the more southern part of his range for our first day’s birdwatching, aiming to work our way back up the coast for a grand finale at Holy Island over the course of the next couple of days. After exploring the area around the River Coquet, south of Alnwick, our next stop was East Chevington, a former open-cast coal mine, now flooded. On the way we stopped by one of the stubble fields to watch the touch-down of a flock of Icelandic Pink-footed Geese. The birds had just started arriving from their summer grounds and, as we watched, more and more appeared, first as dots on the horizon and then as wheeling formations that settled among the rough furrows. East Chevington yielded plenty of Lapwing, Grey and Golden Plover, and six Snipe that flew past the hide. Apart from open cast mines such as this, the whole area north of Newcastle and south of Berwick is prone to sink holes where old mineworkings have caved in and gradually filled with water. This, along with a number of tidal estuaries and vast areas of exposed coastal sand and mud at low tide makes for some great habitat for wildfowl and waders. It’s easy and uncrowded birding, with many of the bays close to the coast road so you only need to pull in to the frequent parking spots to get great views without effort. Cresswell Ponds, for instance, at the southern end of Druridge Bay, is only a few short steps from the road, and can offer interesting birds such as Little Stint, which was showing on our visit. Druridge Bay itself is rightly famous for the number and variety of birds that can be found there, and we certainly enjoyed watching a large number of Little Grebes and Sandwich Terns, but parts of it are also very popular with families enjoying the golden beach, as well as many dogwalkers. Lynemouth Bay, a little further south, is rockier but perhaps quieter and a good stopping point which gave us Knots, Oystercatchers and Sanderling, as well as over 100 Curlews. On our way back up the coast, we stopped by at one lesser-known vantage point, certainly to people from outside the area. It is The Wynding, the approach road to the Bamburgh Castle Golf Club. You are high above the coast there and overlooking some bird-rich habitat. As we set up our scopes we were over-flown by a small flock of Pale Bellied Brent Geese, flying north. Our enjoyment of three juvenile Gannets plunge-diving was momentarily interrupted by the arrival of a pod of five Harbour Porpoise, making their way down the coast. At the shoreline, Common Scoter bobbed and we were amused to see the obvious consternation among a raft of Eider when a Great Skua arrived and settled in the middle of the flock. Like polite people at a party when a well-known drunk arrives, the Eider quietly radiated outwards to leave the Bonxie in splendid isolation. A similar parting of the flocks occurred at the shallow, almost enclosed estuary of Budle Bay, between Bamburgh and Lindisfarne, as we were appreciating four Red-breasted Mergansers. As one, several hundred Lapwing rose and circled, the cause becoming apparent as a young Peregrine soared through the rapidly dispersing flock. Its youth and inexperience counted against it, though, and after several minutes of fruitless circling it abandoned the chase without a catch. Martin’s decision to leave Lindisfarne until last gave us a wonderful ending to our autumn Northumbria birding experience. It was a bright, sunny midday, albeit with a chilly wind, when we drove to the causeway to catch low tide. We had a few moments to follow the footpath through the saltmarshes on the mainland side to appreciate the waders taking advantage of the exposed mudflats. A Jack Snipe flushed from the Marram grass beside the path and upwards of 150 Curlew flew overhead. On the way back a Wheatear paused to be admired on a piece of driftwood. As we crossed the causeway we kept a keen eye on the posts that mark the Pilgrim’s Way, the walking route across the mud, and were well rewarded by the sight of a late-departing Osprey which was using one of the posts as a resting point. The dunes at the island end of the causeway are worth a stroll for waders and migrants in the season, as it’s often the first landfall for many birds. If you walk among the dunes, though, you need to beware of the Piri-piri Burr. This fast-growing plant was accidentally imported from New Zealand in wool supplies. The sticky seedpods get everywhere! Once on the island, we made our way from the car park to the road leading to the Castle. Martin was aiming in particular to see what could be found in the Rocket Field, the area behind the Coastguard’s flares store. It proved to be a fruitful area, with about 1000 Golden Plover and nearly 600 Redshanks gathered around the shallow pools. We then headed up onto the Heugh, the high ground next to the Abbey ruins, concentrating on the view from the top, hoping for Lindisfarne’s speciality Pale-bellied Brents among the geese flocks. In the sea between the island and the mainland, near the twin navigation obelisks, we soon picked out huge strings of geese floating and wading close to the far shore, but they were too far for accurate ID, even with the scopes. One final thrilling sight awaited us at the start of the causeway back to the mainland. A Peregrine, which had obviously been using a Pilgrim’s Way post as a lookout, had caught some prey and was devouring it at the base of the post. As the light faded and the cold wind whipped across the exposed mud, it was a wild sight to cherish as a memory of a special place.